To our delight, our Migumo rain chain is being used in Philippines. In comparison to other products in our product line, Migumo rain chain has a pure Japanese style particularly for traditional Japanese style homes and buildings. 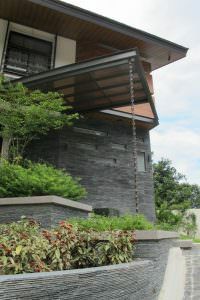 However, the matching between the exterior stone wall and metal rain chain creates a unique feel, resulting in a wonderful residential home. 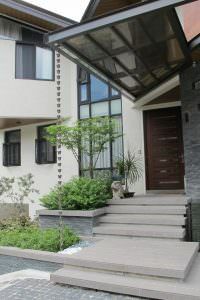 From the looks, the rain chain is for draining the small roof of the front door and certainly it is functionally effective but also in terms of residential design, the rain chain’s presence is serving as an effective accent as well. 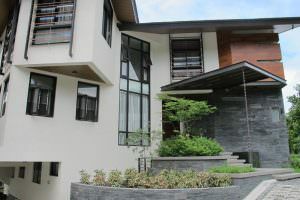 Rain chain was borne in Japan as a drainage system to enjoy and appreciate the rain so when using it in Philippines, I believe that the true benefits will be felt. Thank you Eloisa for the great picture! Your home looks fantastic! Migumo is principally made of copper, but the line connecting chains for strengthening purposes and the cup to collect the water from the chain are made of stainless steel. Rain is said to be slightly acidic by absorbing oxides from the air originally dispersed by cars and factories, so it appears that if the middle part of the rain chain where rain passes through the most is pure copper, it will erode and breakdown in some occasions. Therefore, we used stainless steel in the middle portion with the most frequent water flow to strengthen its durability, enabling you to use the rain chain for decades and decades to come.